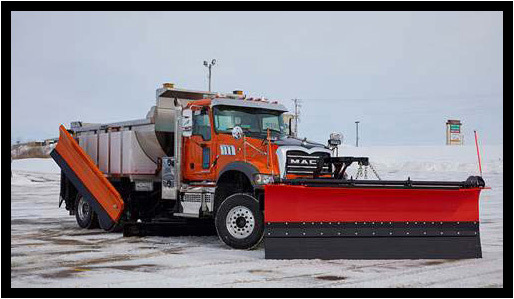 INDIANAPOLIS (March 7, 2018) – Mack Trucks today spotlighted the Mack® Granite® Axle Forward model featuring increased ground clearance for underbody scrapers, making it ideal for snow removal. Mack made the announcement at the 2018 Work Truck Show, March 6-9, at the Indiana Convention Center, Indianapolis. The Mack Granite is available with both the Mack MP®7 and Mack MP®8 engine and the mDRIVE™ HD 14-speed automated manual transmission with creeper gears. The mDRIVE HD with creeper gears weighs approximately 150 pounds less than an automatic transmission, providing a lighter-weight option. Mack Granite models come standard with Mack ClearTech™ One, a single-package Exhaust Aftertreatment System (EATS), which combines the diesel particulate filter (DPF), selective catalytic reduction (SCR) and diesel exhaust fluid (DEF) into one unit. ClearTech One is 17 pounds lighter than other systems and frees up much-needed frame rail space to increase flexibility for customers needing water tanks and chutes. For more information about the Mack Granite Axle Forward model with increased ground clearance, please contact your local dealer or visit Mack booth No. 3527 at the 2018 Work Truck Show.